LONDON, GREATER LONDON, UK, November 8, 2018 /EINPresswire.com/ -- Growth in law firms with revenues of $5 million or more is outpacing the growth of smaller firms around the globe, a report from The Business Research Company shows. The difference is particularly marked in North America and Western Europe, where the majority of large law firms are headquartered, but it applies in all regions. The higher growth rate among larger firms is particularly notable as the partnership model, the major differences between different legal systems in different countries and the difficulty of commoditizing high-end legal services mean that there are no globally dominant law firms. 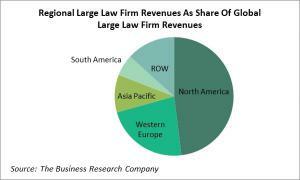 North America and Western Europe, the regions where the large law firms' growth is outpacing that of the small law firms by most, are also the regions where the law firms had the largest share of legal services business in 2017. In both North America and Western Europe, they had about 66% of all the legal services market in 2017, whereas in Asia Pacific and South America they had only 58% and 56% respectively. In the USA and Uk, their share was even higher than in these countries' wider regions - 68% in the USA and 71% in the UK. Data Segmentation: Legal services market size and growth for 7 regions and 12 countries; global regional and country legal services market size and growth segmented by type of service - B2B legal services, B2C legal services, criminal law practices, hybrid commercial practices; global, regional and country legal services market size and growth segmented by end-user industry - financial services, mining and oil & gas, manufacturing, construction, IT services, other services, other end users; global, regional and country legal services market size and growth segmented by type of service provider - large and small firms.